Irish whiskey is whiskey made on the island of Ireland. Most Irish pot still whiskey is distilled thrice, while most (but not all) Scotch whisky is distilled twice. Peat is rarely used in the malting process, so that Irish whiskey has a smoother finish as opposed to the smoky, earthy overtones common to some Scotches. 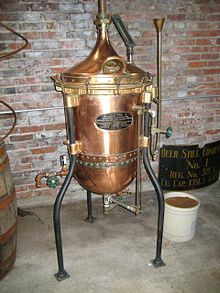 There are notable exceptions to these rules in both countries; an example is Connemara peated Irish malt (double distilled) whiskey from the Cooley Distillery in Riverstown, Cooley, County Louth. Pyotr Smirnov founded his vodka distillery in Moscow in 1864 under the trading name of PA Smirnoff, pioneering charcoal filtration in the 1870s, and becoming the first to utilize newspaper ads along with charitable contributions to the clergy to stifle anti-vodka sermons, capturing two-thirds of the Moscow market by 1886. His brand was reportedly a Tsar favorite. When Pyotr died, he was succeeded by his third son Vladimir Smirnov. The company flourished and produced more than 4 million cases of vodka per year. Invergordon distillery is a Scotch whisky grain distillery at Invergordon in Easter Ross, in Ross and Cromarty, Highland, Scotland. Teeling Distillery is an Irish whiskey distillery established in Dublin in 2015. It is the first new whiskey distillery to have opened in Dublin, once a world whiskey distilling capital, in over 125 years. In fact, with the last of the original Dublin distilleries having closed in 1976, it is the first whiskey distillery to operate in Dublin, once home to at least 37 distilleries, in almost 40 years. 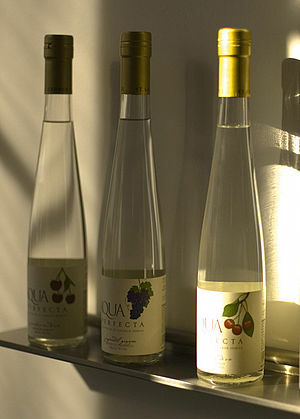 An eau de vie (French for spirits, literally "water of life") is a clear, colourless fruit brandy that is produced by means of fermentation and double distillation. The fruit flavour is typically very light. Akvavit or aquavit (/ˈɑːkwəviːt, -və-/; also akevitt in Norwegian) is a distilled spirit that is principally produced in Scandinavia, where it has been produced since the 15th century. Akvavit is distilled from grain and potatoes, and is flavoured with a variety of herbs. 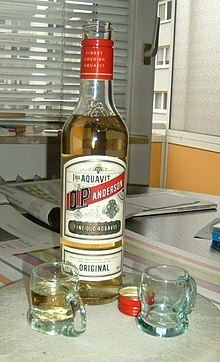 Akvavit is also popular in Germany. Bruichladdich Distillery (/brʊxˈlædi/ bruukh-LAD-ee; Scottish Gaelic: [pɾuə'xl̪ˠat̪ɪç]) is a distillery on the Rhinns of the isle of Islay in Scotland. The distillery produces mainly single malt Scotch whisky, but has also offered artisanal gin. It is owned by Rémy Cointreau and is one of eight working distilleries on the island. The Lemon Drop cocktail is typically prepared with vodka, lemon juice, triple sec and simple syrup. The glass may also have a sugared rim.